In all Muslim countries, also in Kyrgyzstan, Nooruz is celebrated on March 21, the day of the vernal equinox. 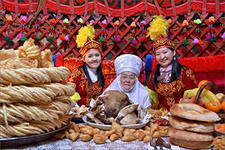 This day the Kyrgyz people lay the cloth with various dishes. The main traditional dish is sumalyak, as it is prepared specially for this holiday. The preparation of the dish is accompanied by chanting and dancing. This day people hold festivities, visit their friends and relatives in order to honor the older members of family. The date of Orozo Ait (Id al-Fitr) is appointed by the lunar Islamic calendar. Id al-Fitr means the completion of fasting month of Ramadan. During this month, all Muslims keep a fast, it is nit allowed to take food and water before sunset. The holiday is celebrated after the end of the holy month. The day begins with a morning prayer. Orozo Ait is one of the main Islamic holidays. Kurman Ait or Id al-Adkha is the feast of Sacrifice. There is a legend, once one of the ancestors of the peoples of northern Arabia Ibrahim saw Allah in his dream, who told him to bring to sacrifice his son Ishmael. When he was ready to kill the boy, Allah was sure in his devotion and told him to bring him a lamb. So, this day every faithful Muslim sacrifices a sheep or lamb. Meat is used for family holiday meal, the rest is given to the poor people.